The rookie duo of the portly Hyun-Jin Ryu and sculpted Yasiel Puig helped pull the Dodgers within 2-1 in the NLCS. Ryu returned to the dominant form that ranked him No. 6 among all pitchers through August 16, and Puig blasted an RBI-triple to right to end a hitless series as the Dodgers won 3-0 Monday in Los Angeles. 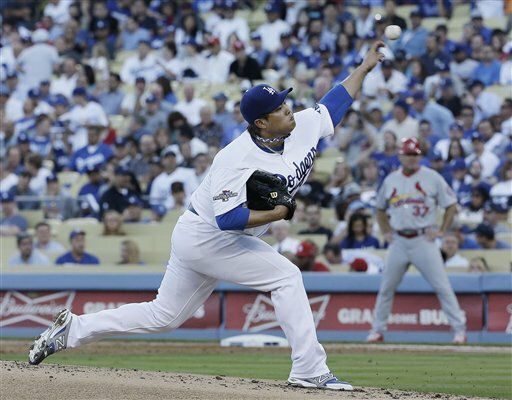 Ryu threw seven shutout innings to save the Dodgers from falling to an almost insurmountable three games to none deficit against the Cardinals in the NLCS. Brian Wilson struck out two in eight, and Kenley Jansen finished the shutout with a Save in the ninth inning. The even bigger hope for the series came from the two players who had come back from injuries in the Dodgers last to first run this season. Hanley Ramirez played despite his rib injury and had two hits, and Carl Crawford made a daring dash from second to home after holding up to see if a pop-up would fall over the infield to provide the 3-0 win in the bottom of the eighth inning. Three top-12 pitchers have failed to win in the first three games, with the Dodgers’ Zack Greinke (12th at www.valueaddbaseball.com) throwing for the Dodgers in Game 1, Clayton Kershaw (ranked 1st) in Game 2, and the Cardinals Adam Wainwright (ranked 6th) for the Cardinals Monday. Tuesday’s match-up features the Cardinals Lance Lynn (19 victories in 33 starts, ranked as the 60th best pitcher) versus the Dodgers Ricky Nolasco (17 victories in 33 starts, ranked two spots ahead of Ryu as 27th best). Nolasco had Victories in 10 of his first starts after being acquired from the Marlins in early July and did not allow more than three runs in any of those 12 starts, but then gave up 17 runs in just 12 innings during his last three starts and was skipped over in the last series to have Kershaw pitch on short rest (see game-by-game results here).